The Howard Hughes Corporation® (NYSE: HHC) and its wholly-owned subsidiary, The Woodlands Development Company, announced today that Truluck’s and Starbucks® will join an assortment of other popular food and beverage coming to Hughes Landing®, a 66-acre mixed-use development in The Woodlands®. Truluck’s will be located in Restaurant Row in Hughes Landing while Starbucks will be located on the retail level of One Lakes Edge – the first 390-unit luxury development in Hughes Landing. Situated along Lake Woodlands, Hughes Landing is a premier “lifestyle intersection” which features a mixture of upscale eateries; popular retailers, including Whole Foods Market®; entertainment venues; up to 800 multifamily residences, including One Lakes Edge opening in April; multiple Class A office space with additional development underway on Three Hughes Landing expected to be complete in November; and a full-service Embassy Suites for business and leisure travelers to open in late 2015. Truluck’s plans to begin construction on its 10,000 square-foot space in spring 2015 with an expected completion date in the fall of 2015. Once open, the restaurant will offer fresh seafood, including crab from around the globe, flavorful steaks and an expansive wine selection. Starbuck’s 1,820 square-foot location is expected to open in March and will provide area tenants and visitors with the brand’s signature selection of coffee, teas and snacks. Truluck’s and Starbucks add to the growing number of well-respected dining establishments coming to Restaurant Row in Hughes Landing. 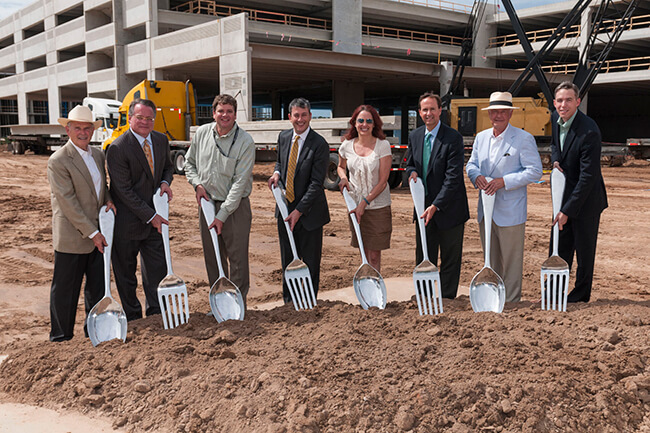 Eateries to open in spring/summer 2015 include Del Frisco’s Grille, an 8,000-square-foot restaurant which will offer modern American cuisine; Escalante’s Fine Tex-Mex and Tequila, featuring “made from scratch” Tex-Mex cuisine; California Pizza Kitchen serving a variety of California-style dishes including hearth-baked pizzas; and Local Pour, a gastropub with nightly entertainment.